Caleb Harris was the second of seven children growing up in a musical household in Borger, Texas. When his father, a pilot and rancher who played trombone on the side, decided to take up piano, Caleb and his older brother followed suit. There were also some country singers in the family tree, and Caleb Harris added voice to his musical studies as a teenager. "I've always found the human voice the most intriguing instrument," he said. "None of the others sing text. The voice is the one that is really capable of the broadest range of emotions." 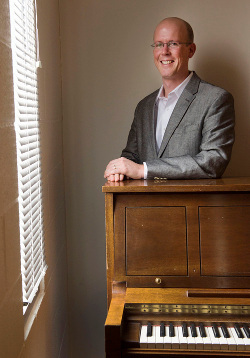 He earned degrees in piano performance from Oklahoma Baptist University and the Eastman School of Music, with secondary study in voice and conducting. He held the Nat King Cole Fellowship at the Boston Symphony Orchestra's Tanglewood Music Center for two summers, studying piano, art song, opera — "we did it all," he said. "That led to lots of opportunities." Harris has appeared as a piano soloist, chamber musician, vocal coach and conductor across the United States, Europe and Asia. He was hired as the Utah Opera's chorus master in 2014.